Jim's newest CD: "Only Two Things"
“Jim's work is absolutely breathtaking." "This music pulls me in deeper to the depths of my own soul." "At complete peace while listening to your music." "Your playing is so soothing. We love your music ... Your music is just a blissful escape into a dreamworld ... It's amazing." 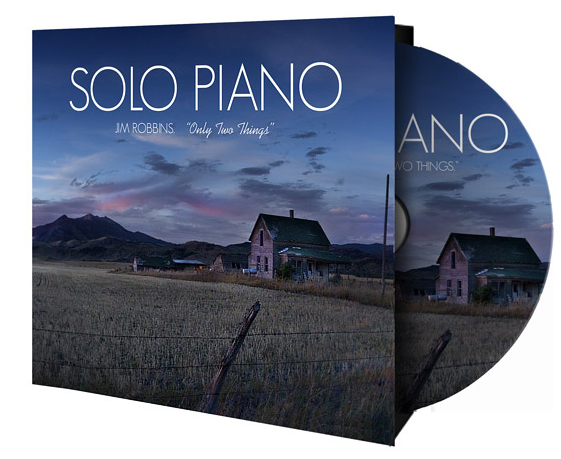 Reminiscent of solo pianists like George Winston, Liz Story, Lyle Mays, or Keith Jarrett, Jim Robbins plays with an expressiveness that has lead listeners to call his solo piano work “absolutely breathtaking, “remarkable,” and "one of the most unique and beautiful listening experiences I've had in years." "Cayuga's Valley," a track from Jim's newest CD, Only Two Things, reached #1 on the list for "Top MP3 Downloads in the Last 10 Days" on the leading jazz website, All About Jazz.com. Why the album title, "Only Two Things" ? "There are only two things that pierce the human heart: Beauty and affliction." This CD has been mastered by GRAMMY-winning mastering engineer, Mark Donahue, at Sound Mirror Studios in Boston. CD cover art image and site header image: Courtesy, Montana Panoramic: Outstanding photography of the American West.